I am currently finishing a ghost story/Mississippi legend called “The Legend of Stuckey’s Bridge” and the foreword will be penned by none other than Mr. Ghost Story himself, Pat Fitzhugh, the author of “Ghostly Cries from Dixie” and “The Bell Witch: The Full Account.” I have been a long-time admirer of Mr. Fitzhugh and his ghost stories and am excited to share this story with you through his eyes as well as mine. ~ or supernaturally ~ hehe. Click on the links above to visit Stuckey’s facebook page and like it to stay up to date, and to visit Mr. Fitzhugh’s blog and book pages. Tell him Stuckey sent you. 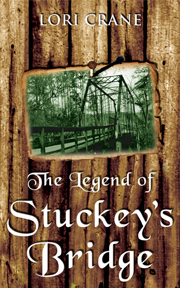 “The Legend of Stuckey’s Bridge” coming June 2013 to Amazon. This entry was posted in "The Legend of Stuckey's Bridge", A to Z Blog Challenge 2013, historical fiction, Kindle, Mississippi, My Books, Pat Fitzhugh. Bookmark the permalink.